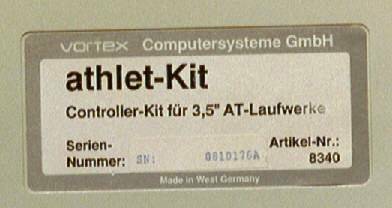 The Athlet is a full length Zorro II card which provides the Amiga with a 3.5" IDE interface. The original configurations came with a 43/90/130 or 180MB Fujtisu hard disk. The hard disk can be mounted and powered directly from the card. The card also has 4 x 30pin SIMM slots (o waitstates) for up to an additional 4MB of RAM. SIMMs must be added in pairs and only 1MB SIMMs are supported. The memory is configured by jumpers on the card. Another jumper tells the card if it is being used under Kickstart 1.2 or 1.3 and autobooting is possible under both versions. At least early versions of this board are reported to have problems if RAM is used on the card, as well as additional 32bit RAM being used on an accelerator. Thanks to Jan Dwornizky and Rainer Schreurs.